So far the journey Livy has taken us upon has seen a perfection of Kingship emerge- on the one hand the King as a charismatic ruler, on the other the King as religious and moral leader, on the one hand the King as general, on the other the King as priest. We now need to come to another aspect of Kingship- the King as the creator of constitutions. 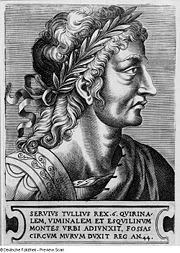 Livy describes in fine detail the way that Servius Tullius, the King after Lucius Tarquin and the penultimate King of Rome, created the Senate and the concept of the popular vote. Popular votes were used before- Livy describes them being used for judicial reasons by Tullius Hostilius (I.26). But before he can describe the revolution that will bring down the Republic- he needs to provide an account of how the senate and the Roman people developed an appetite for politics and an awareness that they might be involved in it. So how did that happen? And what did the King, Servius Tullius, gain that he gave up his sole hold upon political power? Livy provides an explanation and an answer. From the earliest days, Rome was involved in warfare. Whether in the age of Romulus, where he implies personal charisma would win the Romans battles, to the age of Ancus, war had been a way of life for the Romans. In the reign of Lucius Tarquin- he had proposed the extension of Rome's cavalry forces and had partially succeeded in expanding the armies of the new city (I. 36). His successor obviously thought that this small progress needed reinforicing. Rome needed an army. Unsurprisingly, Servius turned immediatly to his own citizens in order to provide that force. He organised them into tribes- 12 at the beggining- and compelled those tribes to produce both resources and military forces for him- indeed Livy suggests that the name tribe derives from the Latin for tribute. The Roman census which began at this point was for Livy a compulsary activity. But Servius had to give up something in order to gain this, he gave up to the population and the senate the power to vote on proposals. We can already see a theme of Roman history about to develop- in that Servius deliberately set up the electoral system so that the richest would decide for the poorest- the tribes voted in order of wealth and the highest classes could thus decide the fate of the poorest. Livy imagines that there was a sort of manhood suffrage before this (I. 43), a kind of primitive democracy- but what this did was establish the organisation of the Republic- an organisation which endured down to Livy's day- and thus established a permanent basis for power outside the royal house. Livy is offering us here a model of transition- from a dictatorship of plebiscite to a monarchy of legal form. The first sees a kind of primitive equality, the second raises the aristocracy above the rest of the population. But he also more interestingly provides us the mechanism that explains the change- the exchange between the King and his new complicated society is that for his willingness to entertain the wishes of his subjects, they allow him to regulate their complicated society. By placing property institutionally inside the law, he acquires the right to both regulate and tax it. By placing men's wishes at the heart of political debate, he acquires the ability to dispose them upon the battlefields of Italy. His successor accused him of using the census to tax and to find men for war: Tarquin Superbus argued that Servius was motivated not by an unusual royal generosity but by the creation of new powers for the King through the creation of new rights for others. The Senate were joined thus by a people- and by a people disposed according to property. We do not know if this was the actual sequence by which a republic was slowly created. What we can know is that this is a plausible way that such republics are created. The great representative institutions being formed and strengthened because they fortified the power of the King. The other side of the coin is the argument that citizenship is linked to being a soldier- an argument found in Livy's greatest interpreter, Machiavelli, for example. That argument dominated thinking about Republicanism right up until the Scots formulated the notion of commercial citizenship- something which marks our world as modern is that we are fellow citizens of David Hume and Adam Smith, not of Titus Livius and Nicollo Machiavelli.